There is a lot wrong with this cozy mystery but I did find that it read fast so I did finish it. The characters are really flat. The most developed character in this book is the Cat Misfit. Two girls move to town and open up a bookstore/coffee shop. Neither character has any connection to the town, anyone in the town or even to each other. Most cozies have the best friend helping the sleuth solve this mystery but instead this one just shakes her head at the trouble she get into. They make no effort to really get to know the town or the residents. Likewise the author does not go to a lot of trouble letting us know the characters or the town. They just sit in their empty store hoping customers will arrive and go home to their separate empty houses. The mystery itself is not much better. I did figure out the who did it rather early. There is no reason for the sleuth to solve the crime. All she does is act nosy with people she does not know and make some stupid moves. This book seems to be a paint by the numbers cozy without a lot of life. I would hope the next one is better but I am not sure I will read it. Although story line was interesting, the style of writing seemed to be written for youth. This author needs to increase details and decrease numbers of repetition in the story. I was disappointed in this book and it took perserverance to complete it. I enjoyed the mystery and romantic story lines of this book. I enjoyed the characters and their quirks. The only parts of this book that I did not enjoy was when the characters did something very unrealistic. Best friends Krissy and Vickie have moved to Pine Hills and opened a bookstore and coffee shop. 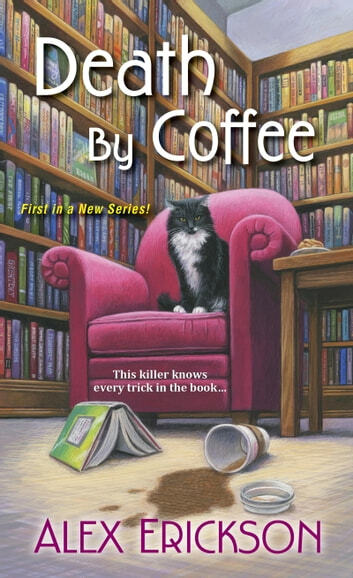 They’ve even named it Death by Coffee after one of Krissy’s dad’s bestselling mystery novels. But they find themselves in a real life mystery on their first day in business when a customer buys a cup of coffee, takes it to his office across the street, and dies. Krissy will have to act fast to clear their shop of any wrong doing in the crime. The book sounded like fun, and I really wanted to like it, but the truth it is turned out to be average. The plot was a little uneven at times, but it still advanced to a great and logical climax. The suspects were good, but most of the series regular characters were a bit flat. Krissy did some embarrassing things that made me cringe, and her cat was annoying. Here’s hoping the series gets better as it goes along.